Please lightly rinse recyclables, and keep out items smaller than 2" x 2". Download a flyer for your fridge or recycling bin here. DO buy materials made from post-consumer recycled materials—you'll help create markets for recyclables! DON'T place styrofoam or black plastic in the recycling. There is no current market for these materials. DON'T put anything smaller than two inches on two sides in your recycling bin. DON'T put anything with leftover food on it in the recycling. That's gross! And it reduces the value of the recyclables. Some of the items that are not accepted in your recycling bins CAN be taken to our Additional Recyclables Collection Center in Barre. Items include: Paint, batteries, bulbs, clothing, electronics, house appliances, and so much more! Everyone has an old paint can or two lying around... Wondering what to do with your old un-used paint? Find out more about paint recycling here! 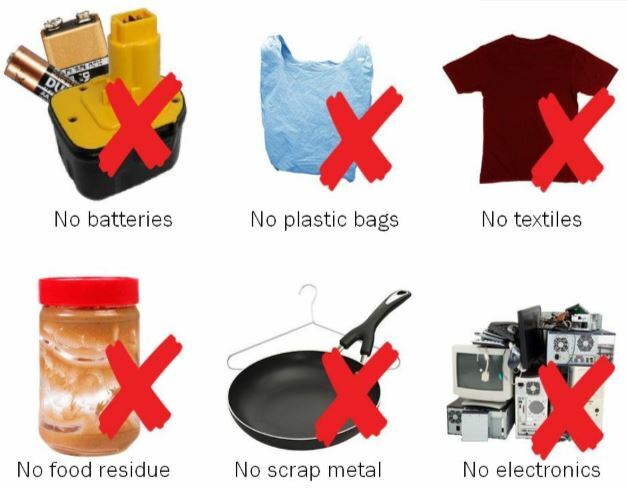 Each year CVSWMD holds a number of Special Collection Events to collect hazardous and other waste items that require special handling or are not usually accepted at depots in the district. Find out about Haz Waste collection days near you!